The New York Times reported that your cell phone number is more valuable to hackers and people trying to steal your identity than your Social Security Number. Why? Because it is tied to so many databases including your medical records and bank accounts. For this very reason, you should not just share your personal cell phone number with anyone. It is best to have another phone number you can share publically on websites, social media, "registration" forms. MBizFone is designed for anyone who wants either a local or toll-free phone number that can be used to separate their business from personal life. While we do not believe you should never share your cell phone number with contacts or clients, we strongly recommend using an alternate phone number for all your marketing purposes. When you have a VoIP number, like the one provided with your MBizFone account, you can make it harder for people to steal your identity since only people you know will get your cell phone number. 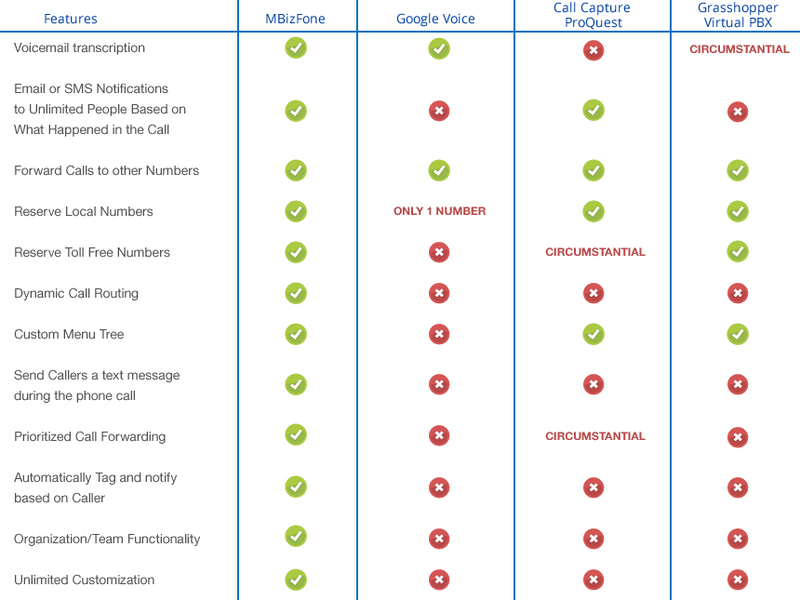 In addition, the features you see below will prove to you that MBizFone is MORE than just a phone number. It is a business solution as it can provide you with text message autoresponder, multiple call flows, do not disturb times for when you want to be "off hours" and much more. If you have questions, we encourage you to check out the frequently asked questions page or schedule an online demo. You should also ask yourself the following questions as they will better help you determine if MBizFone is best for you and your organization. In addition, if you request an online demo, we will show you how it can be tailored to fit the needs of you and your organization. Do you use your cell phone number for work? If you answered "Yes" to this question, this is the first reason you should look at using MBizFone. Just read this article from USA Today that points out that people are sharing their cell phone number far too frequently and how it exposes them to identity theft. With MBizFone, you will receive a unique, local telephone number that can be used for marketing and can easily be provided to current and prospective clients. Your cell phone number is used on a lot of private documents, including financial and medical records. By sharing your cell phone number publically, it makes it easier for hackers to access this information. Do you keep a record of all your text messages? If all you want is a call log and platform to back up text messages using your cell phone number, we recommend 4EverText for your Android device. Use the code "MyEBOSS" to receive a discount. However, if you are wanting to text from your business number or dedicated direct dial number, then MBizFone is what you want. With your MBizFone account, you are able to have a dedicated number that you can share in public and use to make and receive phone calls and even text messages. At any point in time, you can click a button to view your entire text message history. Can you track your call history and phone calls? If you answered "No" to this question, then register for MBizFone today! With MBizFone you are able to archive and even tag EVERY phone call. This makes it easier to identify when calls were made and what the purpose of the call was. For example, you could have tags that identify whether the call is a potential lead or was made to request support. To make it even better for you, there is no limit on space so you can RECORD ALL YOUR CALLS and easily review the context of any conversation at a future date. Do you utilize text message marketing and keywords? Whether you answer "Yes" or "No", you will with MBizFone! The only problem with using short codes, is they do not help people connect with YOU. Unless you are paying a huge monthly fee to have your own dedicated short code number, there are a number of organizations using the same shortcode you use. This means it is more difficult to get the keywords you want and the keyword has to be typed as is. With MBizFone, you can select ANY keyword you want and it is attached to YOUR unique phone number which anyone can then use to contact you directly. We are glad that you want to learn more. Below are some more questions that you should ask yourself. If these don't convince you, then we ENCOURAGE you to CONTACT US for a FREE demonstration of the platform. Could you benefit from a call flow/tree? When you call an organization, it is common now to have to listen to a brief recording so that you know what to do next. Whether you are a solopreneur or part of a team, you may wonder how this helps you. It is simple! All your incoming calls will automatically be tagged based on your call flow. This will help you identify quickly who is calling, why they called, and search by types of calls at a later date. By having the ability to create a call flow within just 1 user account, you can filter calls as needed and even prioritize some over others. Let MBizFone help organize your calls and make it easier to work on the go. Do you want to have multiple direct-dial-numbers? Do you have multiple offices but either want to answer all calls yourself or send them to a single operator? If so, you can now easily add direct dial numbers to your account and have a dedicated phone number for each market (different area code or same area code with different purpose for each phone number). All calls and messages can be routed exactly as you want ... based on the phone number called. If you are needing to host conference calls, a dedicated number can provide your own bridge and password.